revealing Your power to Your disciples. You have redeemed the world from sin. and You showed Your disciples the glory of Your divinity. guide us in the way of Your divine commandments. dwelt on earth in a human form. today He mystically reveals the image of the Trinity on Mount Tabor. and for a short time He concealed His incarnation. manifesting the splendour of the original beauty. and so their eyes saw only as much as they could behold. the Lord of the living and the dead. “This is My beloved Son; hear Him! make us worthy to inherit Your never-ending Kingdom. and go into the house of our God. the glory of the only-begotten Son of God the Father. let us sing the praises of the consubstantial Trinity forever. for You are the author of the Law and the fulfilment of the Prophets. They were witnesses of Your Transfiguration. that we may sing Your praises forever, O Lord. that human nature was re-established in its original splendour. made possible by the Cross of Christ. The heavens are Yours, the world is Yours. You founded the earth and all it holds. for indeed You ascended the mountain with Your disciples. restoring its very elements to the glory and brilliance of Your divinity. O Creator of all, glory to You! Tabor and Hermon shout with joy at Your name. they were rapt in amazement and completely changed. You remained the only-begotten Son and the Saviour of all. Showing the change that mortals will undergo, O Lord,* when they enter your glory at your second and awesome coming,* You were transfigured on Mount Tabor. * Elijah and Moses conversed with You;* and seeing your glory, the three disciples whom You had chosen* were struck with your splendour, O Lord. * As You covered them with your brightness,* also send your light upon our souls. You were transfigured on Mount Tabor, O Jesus;* a bright cloud covered your apostles with your glory as with a tent, O Lord. * They cast their faces to the ground,* unable to gaze upon the inaccessible glory of your resplendent face,* O Christ our God and eternal Saviour. * As You covered them with your brightness,* also send your light upon our souls. We extol You,* O Christ the Source of life,* and we venerate the holy Transfiguration* of your most pure flesh. The Lord is great and worthy to be praised in the city of our God and on his holy mountain. Who shall climb the mountain of the Lord? Who shall stand in his holy place? When You went up to the mountain with your disciples, O Lord,* and You were resplendent with the glory of the Father,* Elijah and Moses stood there with You;* for the Law and the Prophets serve You as God. * The Father attested to your divine filiation and called You his beloved Son. * With You we praise Him in the unity of the Holy Spirit. Through the splendour hidden under the flesh of your nature,* You showed the disciples the splendour of your divine beauty on Mount Tabor. 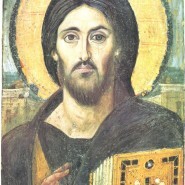 * Thus You enlightened the disciples who were with You, O Christ our Benefactor. * Realizing that your beauty was unbearable, they cried out: Holy are You! * For You are the One whom no one can approach;* yet the world has seen You in the flesh. * And You alone are the Lover of Mankind. verse: The heavens are yours; the world is yours. In Tone 2, Today the whole world is filled with joy,* for Christ is transfigured before his disciples on Mount Tabor. Today the whole world is filled with joy,* for Christ is transfigured before his disciples on Mount Tabor. Have mercy on me, God, in your kindness. In your compassion, blot out my offence. In Tone 5: Having revealed a small ray of your divinity* to those who climbed the mountain with You, O Saviour,* You made them partakers of your boundless glory. * Therefore, they cried out in awe to You:* It is good for us to be here. * Together with them, we shall forever praise You, O Christ our Saviour,* who was transfigured for us. Irmos When Israel walked upon the deep sea as upon dry land, they saw Pharaoh, their pursuer, drowning; and they exclaimed: Let us sing a hymn of victory to God. Refrain: Glory to your holy Transfiguration, O Lord! Christ spoke to his apostles the words of life concerning the kingdom of God by saying: When you see Me shining with the unapproachable light, you shall know that the Father is in Me, and you will joyfully cry out: Let us sing a hymn of victory to God. My friends and disciples, you shall overcome the power of the Gentiles, and their riches shall be your boast; for when I appear shining more brilliantly than the sun, you shall be filled with glory and joyfully cry out: Let us sing a hymn of victory to God. Just as He promised, Christ appeared in glory today on Mount Tabor, clearly revealing to his disciples the image and reflection of his divinity. Filled with the divine brightness and splendour, the disciples cried out: Let us sing a hymn of victory to God. Katavasia When Israel walked upon the deep sea as upon dry land, they saw Pharaoh, their pursuer, drowning; and they exclaimed: Let us sing a hymn of victory to God. Irmos The weak have clothed themselves with strength, and the weapon of the mighty has become powerless; therefore, my heart is strengthened in the Lord. O Christ, You have clothed yourself completely in the nature of Adam, thereby refashioning what had been corrupted. Through your becoming human, You transfigured and glorified our nature. In ancient times Christ led Israel through the desert by means of a pillar of fire and a cloud; today He brilliantly shines forth in glory upon Mount Tabor. Katavasia The weak have clothed themselves with strength, and the weapon of the mighty has become powerless; therefore, my heart is strengthened in the Lord. You were transfigured on Mount Tabor, Christ God,* between Moses and Elijah the wise,* in the presence of James, Peter and John;* and Peter as he stood there, spoke to You:* it would be good to make three tabernacles here:* one for Moses, one for Elijah, and one for You, Christ our Master. * You have shone on them with your light, now enlighten our souls! Irmos O Christ our God, your wondrous plan of salvation has been revealed to me: how your birth from a Virgin would rescue from the power of evil those who call upon You by saying: Glory to your power, O Lord! You appeared upon Mount Sinai, O Christ our God, in the midst of a cloud, the fire and darkness, the thunder and storm. It was there You revealed the written Law. Glory to your power, O Lord! O Christ, as eternal God You make your dwelling in the heavens; as a sign of your glorious plan of salvation, You brilliantly shone forth in glory on Mount Tabor. In ancient times You appeared to your servants amid clouds of fire, darkness, and the whisper of the wind, and spoke with them, O Christ our Master. Glory to your power, O Lord! Moses, who had previously recognized You in the fire of the burning bush, and Elijah, who was taken up into heaven in a fiery chariot, appeared with You on Tabor and revealed your death upon the Cross. Katavasia O Christ our God, your wondrous plan of salvation has been revealed to me: how your birth from a Virgin would rescue from the power of evil those who call upon You by saying: Glory to your power, O Lord! Irmos In the beginning You, as their Creator, separated the light from the darkness so that your works may glorify You in light, O Christ. Now guide our steps in the light of your paths. When You deigned to transform our human nature, O Christ, the mountains prostrated before You; and the sun placed its brilliant rays of light, which fill the heavens, at your feet. Moses and Elijah praised the Saviour on Mount Tabor, and their words lingered in the ears of the disciples: Behold Christ whom we have proclaimed in former times as our God. The unchangeable nature of God, when united with human nature, shone forth with a brilliant light. It revealed to the apostles of Christ a reflection of the immaterial divinity. When the disciples beheld You, O Christ the eternal Light, radiating the brilliance of the Father, they cried out to You: Guide our steps in the light of your paths. Katavasia In the beginning You, as their Creator, separated the light from the darkness so that your works may glorify You in light, O Christ. Now guide our steps in the light of your paths. Irmos When beset with trials, I called to the Lord, and the God of my salvation heard me. Christ our Saviour, shining forth on Mount Tabor as the Light surpassing even the brightness of the sun, has enlightened us. 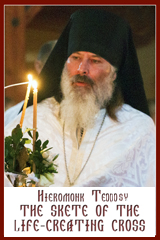 You were transfigured on Mount Tabor, O Christ, thereby overcoming the darkness of error with the glory of your light. The glorious apostles recognized You as God on Mount Tabor, O Christ; and, struck with fear and awe, they fell to their knees before You. Katavasia When beset with trials, I called to the Lord, and the God of my salvation heard me. You were transfigured on the mount, O Christ our God,* and Your disciples saw Your glory as much as they could;* that when they saw You crucified* they might know that You suffered willingly,* and might proclaim to the world* that You are truly the brightness of the Father. Awake from the lethargy that has overcome you, do not lie there on the ground; and you thoughts which weigh heavily upon my soul, arise and ascend to the summit of godliness. Let us hasten to join Peter and the sons of Zebedee, that we may behold with them the glory of God on Mount Tabor and hear the voice from heaven which they themselves heard. It impelled them to proclaim to the world that they had witnessed the glory of the Father. Irmos The three youths of Babylon, who were sons of Abraham, trampled upon the flames in the fiery furnace, singing this song of praise: Blessed are You, O God of our Fathers! When the apostles were clothed in the brilliance of your dazzling radiance on Mount Tabor, O Christ, they cried out: Blessed are You, O God of our Fathers! O Christ, the apostles rejoiced in your glorious majesty, in the revelation of the divine voice, and in the cloud that rained dew, and they sang: Blessed are You, O God of our Fathers! When Peter beheld your unapproachable glory on Mount Tabor, O Christ, he cried out: Blessed are You, O God of our Fathers! The sons of Zebedee were with Christ, the Source of life, when He shone with divine brightness, and they sang out: Blessed are You, O God of our Fathers! Katavasia The three youths of Babylon, who were sons of Abraham, trampled upon the flames in the fiery furnace, singing this song of praise: Blessed are You, O God of our Fathers! Irmos Zealously aflame with love of God, the three youths courageously conquered the threat of the wicked king in Babylon. They stood in the midst of the fire as though covered with dew – and sang: All you works of the Lord, bless the Lord! Your feet have ascended Mount Tabor, O Lord, even though You keep all things in existence by your will. At that time your face became brighter than the light of the sun; and present with You were the chosen of the Law and the Prophets, singing: All you works of the Lord, bless the Lord! When the glory of the Father who bestows majesty to all creation, the infinite Light that knows no evening, indescribably appeared in brilliant glory on Mount Tabor, He deified our human nature so that all may sing: All you works of the Lord, bless the Lord! Overcome with awe, Moses and Elijah clearly witnessed the appearance of Christ on Mount Tabor. Seeing his divine person brilliantly shining with the brightness of the Father, they sang: All you works of the Lord, bless the Lord! In times past, the face of Moses was radiant when he heard the divine voice in the darkness, but Christ clothes himself with light and glory as with a robe. For He who is the Creator of light by nature gives light to those who sing: All you works of the Lord, bless the Lord! When the disciples beheld Christ on Mount Tabor surrounded by a cloud of light, they fell to the ground. Filled with spiritual brightness, they praised Him, together with the Father and the Spirit, by singing this hymn: All you works of the Lord, bless the Lord! Katavasia Zealously aflame with love of God, the three youths courageously conquered the threat of the wicked king in Babylon. They stood in the midst of the fire as though covered with dew – and sang: All you works of the Lord, bless the Lord! Megalynarion: O my soul, extol the Lord transfigured on Mount Tabor. Irmos You gave birth without blemish; for it was God who came forth from your womb, appearing in the flesh upon the earth and dwelling among us. Therefore, O Mother of God, we all extol you. Overcome with awe and enlightened with a heavenly brightness, the disciples looked at one another and fell to the ground in their fear and worshiped You, O Master of all. Confirming this mystery, the voice of God was heard from the cloud; for the Father of lights spoke to the apostles and said: This is my beloved Son. Hear Him! The disciples of the Word beheld an extraordinary mystery on Tabor; and when they heard the voice of the Father, they cried out: This is our Saviour, the Image of the Father. We praise You, along with the Father and the Spirit, O faithful Image of the One-Who-Is, O Seal that cannot be taken away or changed, Son and Word, Wisdom and Arm of God, Right Hand and Power of the Most High. O Word and unchangeable Light,* O Light of the Unbegotten Father,* today we see in your light on Tabor* the light of the Father and the light of the Spirit* which gives light to the whole world. and although unchanged, You appear in the flesh. and You are clothed with light as with a robe. Transfigured before your disciples, You shone more brightly than the sun. revealing You as Lord of the living and the dead. by which You saved the world which was lost in sin. and were transfigured on Mount Tabor, O Lord. for You are the same essence as He and You share his throne. is good for us to be here. He did not realize what he said, O most merciful Benefactor. and was transfigured on a high mountain in their presence. and his garments were whiter than the snow. This is my beloved Son in whom I am well pleased. Hear Him! 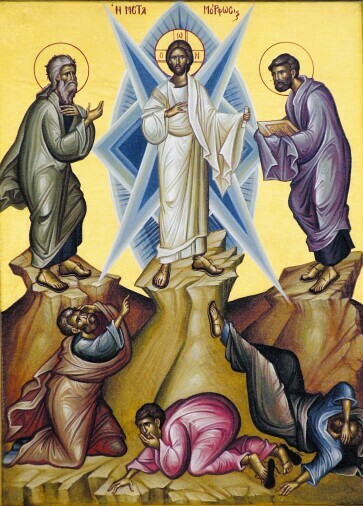 You were transfigured on the mount, O Christ God,* showing Your glory to Your disciples as much as they could bear. * Make Your eternal light shine* also on us who are sinners,* through the prayers of the Mother of God** O Giver of Light, glory to You! Those who trust in the Lord are like Mount Sion which cannot be moved. The mountains surround it, and the Lord surrounds His people henceforth and forever. Lord, who will stay in Your dwelling place, or abide on Your holy mountain? Who will ascend the Lord’s mountain, or stand in His holy place? Lord, send forth Your light and Your truth, these have guided and led me to Your holy mountain. How great are Your works, O Lord, You have made all things in wisdom. And the Irmos, Tone 4: Your giving birth was received as incorrupt; for it was God who came forth from your womb; He appeared on earth in the flesh, and made His dwelling among us. Thus, O Mother of God, all of us magnify you.